ACETex® PET are engineered woven geotextiles fabricated with high tenacity and high molecular weight polyester (PET) yarns. ACETex® PET geotextiles have high tensile strength at very low strain for soil reinforcement applications including soft soil stabilization, base reinforcement, embankments on soft soils and working platforms, etc. The ultimate tensile strength of ACETex® PET geotextiles can reach over 1200kN/m in uniaxial direction as the main loading direction and up to 300kN/m x 300kN/m in bi-axial directions, and the strength is generated typically at the strains less than 10%. Furthermore, ACETex® PET geotextiles have excellent CBR value, demonstrating its outstanding ability to be a reinforcement component. The polyester yarns used for producing ACETex® PET geotextiles have very high tenacity with premium quality, making ACETex® PET be able to provide excellent long-term design strength (LTDS) with excellent ability against installation damage, chemical degradation and creep for a 120-year design life. The usage of PET woven geotextiles in soil reinforcement applications has been proven a very cost-effective construction method, especially when both high-strength reinforcement and separation functions are needed. ACETex® PET geotextiles offer more advantages of easy construction and cost saving because its weight is lighter than most similar products. 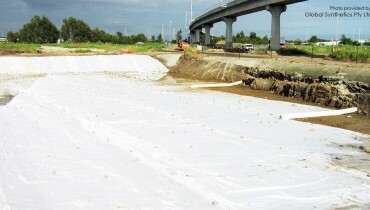 Besides, ACETex® PET geotextile series are available in various tensile strength to meet diverse project engineering needs, and the rolls are available in wide widths up to 5.2m to reduce the textile used for overlap.